If you want to create a special baby shower gift, consider making the new mother a princess castle diaper cake. 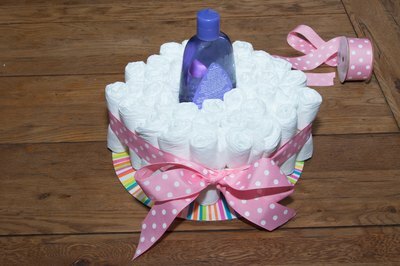 Diaper cakes make great centerpieces at baby showers. 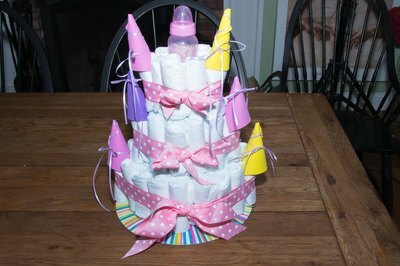 The diapers make the cake completely reusable, and you can add various newborn and baby items to decorate the cake. 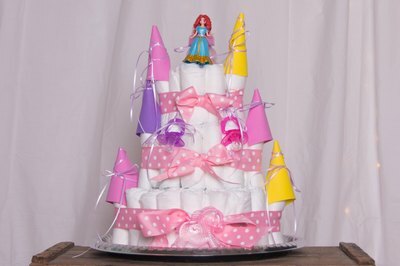 You can easily construct a princess diaper cake in the same fashion as a normal diaper cake, with only a few minor adjustments to the cake’s construction. 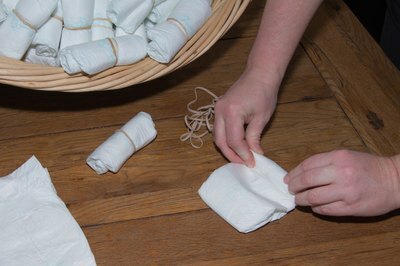 Hold the opened front part of each diaper, and roll it toward the diaper’s closed end so that it forms a cylinder. Secure each diaper with a small rubber band to ensure that it stays closed. Set the 20-oz. bottle of baby shampoo upright on the center of the cake platter. 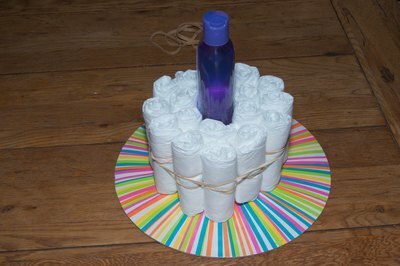 Place four diapers standing vertically next to the bottle to create a ring of diapers. Secure these diapers around the baby shampoo with a medium rubber band. Create another ring of diapers around the first ring, using 12 diapers. Secure these diapers with a large rubber band. You will now have baby shampoo surrounded with two circles of diapers. Make a third ring of diapers around the baby shampoo. The last ring of diapers will consist of 20 diapers. Place two rolled diapers on the outside of the third ring layer. These diapers will be on the left and right of the diaper ring and will become the castle’s towers. Secure all of these diapers with a large, wide piece of pink ribbon. Leave enough room to tie a bow in the front of the diaper cake. Try to tie the bow tightly to ensure that the diapers stay in place. 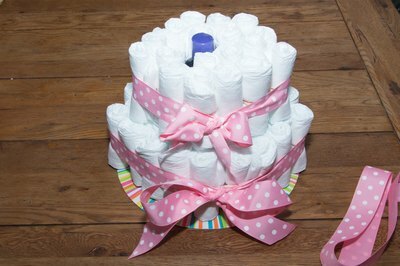 Start constructing the second tier of your castle diaper cake by making a diaper ring with four rolled diapers around the top of your baby shampoo bottle. Secure these diapers with a large rubber band. 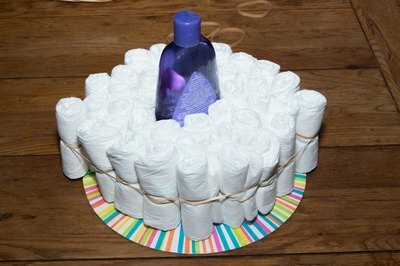 Create a second ring with 12 additional rolled diapers. You will not need a third ring of diapers. Place two rolled diapers on each end of the second tier to create your towers, and use a large pink ribbon to secure all the diapers together. Leave plenty of room to tie another bow. Set the baby bottle upright on top of the second tier. Construct the third and last tier of the diaper cake. You will only need one ring of seven diapers. 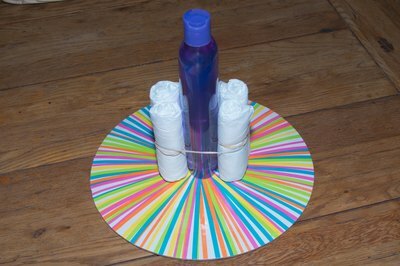 Place one rolled diaper on the left and right of this diaper ring, and hold the diapers together with a large piece of ribbon that you will tie in a bow. Cut the two craft foam sheets into six equal square sections. Roll the foam into a cone shape. You will need to overlap some of the foam to achieve this shape. Staple the cones together. These will go on top of your towers. Tie the cones to the top of each tower with the thin pink ribbon. 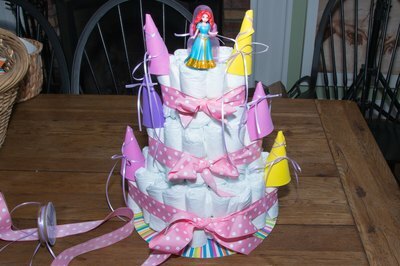 Set a princess doll on top of the castle diaper cake. Secure her with ribbon to ensure that she stays on the cake. Use leftover ribbon to create additional bows on the diaper castle. 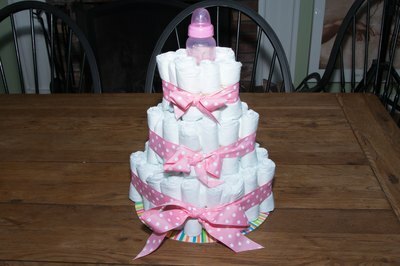 Insert travel-sized baby items, such as baby shampoo, lotions and baby wipes, into the layers of the diaper cake.